The High Commissioner was invited to outline the broad support the UK Government provides in Sierra Leone. He started by detailing the similarities between the British and Sierra Leonean Parliaments. He welcomed the opportunity to speak to the Parliamentary Committee on Foreign Affairs and International Cooperation, recognising the unique political situation and so the unique opportunity for Parliament to make itself relevant, and to promote inclusive politics. He appreciated the important role scrutiny plays in Parliament, and how the meeting was part of the scrutiny process. 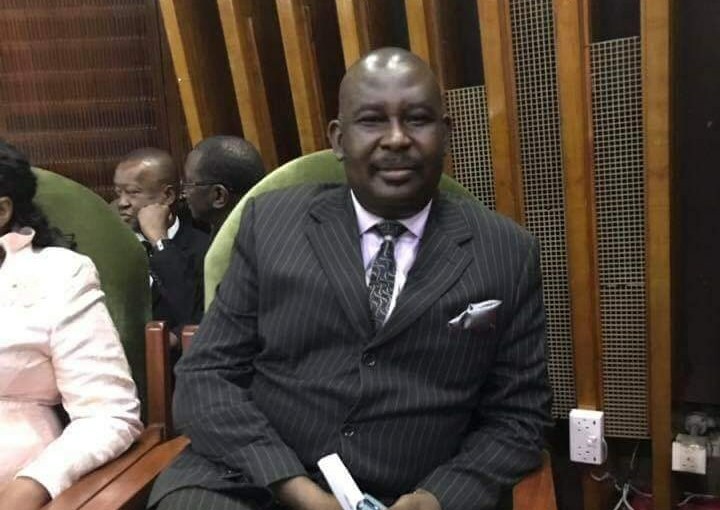 The High Commissioner applauded Parliament’s recent debates on the Commission of Inquiry and the Finance Bill, which he assessed as proper and meaningful. He highlighted the UK’s support to Parliament and the democratic process, most recently via the support the UK gave to the multi-tiered electoral process. He made clear that the UK did not have any influence over the result. He praised the work of the Westminster Foundation for Democracy and Commonwealth Parliamentary Association; and the wider work they do to build democratic institutions. He said the UK would always support Parliamentary prerogatives, but would be quick to comment when Parliament exceeded those prerogatives. His Excellency outlined the support the UK provides to Sierra Leone and the wider world, quick to note that the UK was the only country to meet both the NATO commitment to spend 2% on defence and the UN commitment to spend 0.7% of GNI on development. The High Commissioner spoke about the historic relationship between the UK and Sierra Leone. He described the UK as Sierra Leone’s oldest friend, and the record the UK had of answering the call when Sierra Leone was in need, citing examples such as the Civil War, the response to Ebola, and the 2017 landslide. The High Commissioner went into detail about the assistance the UK Government gives to Sierra Leone. The UK has been one of the largest contributors of aid to Sierra Leone over the past few years. This year (2018/2019) more than £132.5m of UK aid will come to Sierra Leone through bilateral, multilateral and centrally managed programmes. This makes the UK the biggest bilateral donor in Sierra Leone. This assistance, provided by UK aid programmes, is clustered around three core themes – Economic Growth; Governance and Social Development; and Basic Services – which covers support for infrastructure, governance, macro-economic support and rural (and urban) development. The Water, Environmental Sanitation and Hygiene programme is providing improved WASH for 250,000 people by providing boreholes and latrines. It is also improving waste management services for 600,000 people. The Rehabilitation of Freetown’s Water Supply System programme is replacing and improving the water network in the city. It is improving the access to safe drinking water for 600,000 residents and businesses. The Rural Electrification in Sierra Leone programme is providing health centres and communities (including businesses) with solar power to benefit more than 200,000 people. The Increasing Access to Electricity in Sierra Leone programme is improving the availability and reliability of energy for more than 200,000 people in Sierra Leone’s second and third cities (Bo and Kenema). And the new Invest Salone programme will support private sector firms to grow while providing technical assistance to Government to tackle the constraints to growth in Sierra Leone. To support good governance in Sierra Leone the SABI programme (Strengthening Accountability and Building Inclusion) empowers citizens to hold service providers to account and improve service delivery. 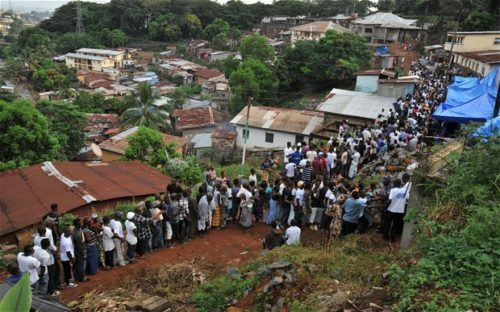 UK aid supports anti-corruption in Sierra Leone through an anonymous citizen bribe reporting platform and campaign, and support to strengthen the Anti-Corruption Commission. 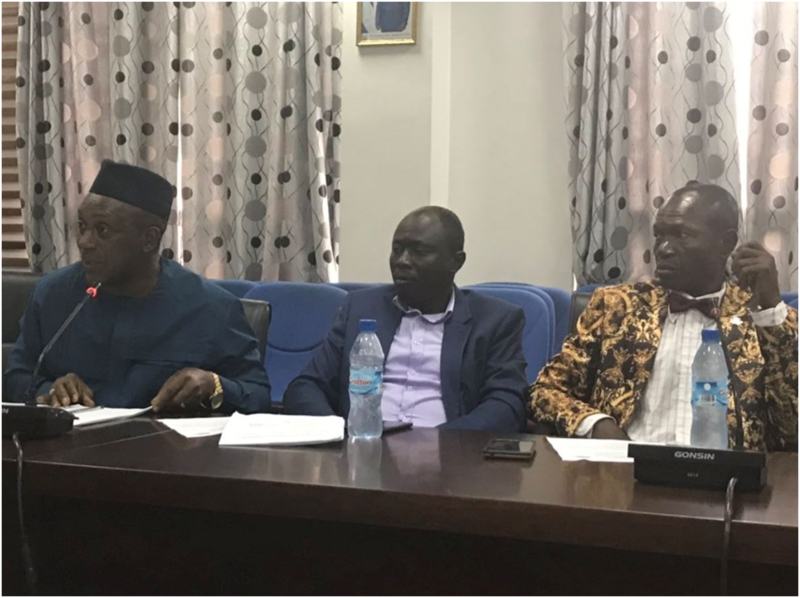 The UK helps improve revenue collection in Sierra Leone by providing technical assistance to the National Revenue Authority to increase revenue flows through improved data, revenue enforcement drives and customs reform. The UK also provides support to basic services in Sierra Leone. The Saving Lives in Sierra Leone programme is reaching 2 million women and children, building health systems to improve health outcomes for under-fives, adolescents, pregnant women and mothers. The Leh Wi Learn programme is working in every non-private secondary school in Sierra Leone to reach 1.4 million children. The UK also funds the International Security Advisory team (ISAT) that is working with the Republic of Sierra Leone Armed Forces and the Sierra Leone Police to strengthen security and stability in the country. The UK-funded ISAT delivers advice, technical assistance and training to help the Government of Sierra Leone address some of the greatest needs in the security sector. ISAT’s priority themes include professionalism and accountability, human rights compliance, readiness for deployment on peace support operations and security sector coordination. The team consists of British civil servants, serving military, and police officers. Where appropriate, ‘train the trainer’ methodology is used to ensure sustainability. Since 2016, 2,860 Sierra Leonean soldiers have received direct ISAT training, while a further 2,190 soldiers have been trained annually by ISAT-enabled army instructors. 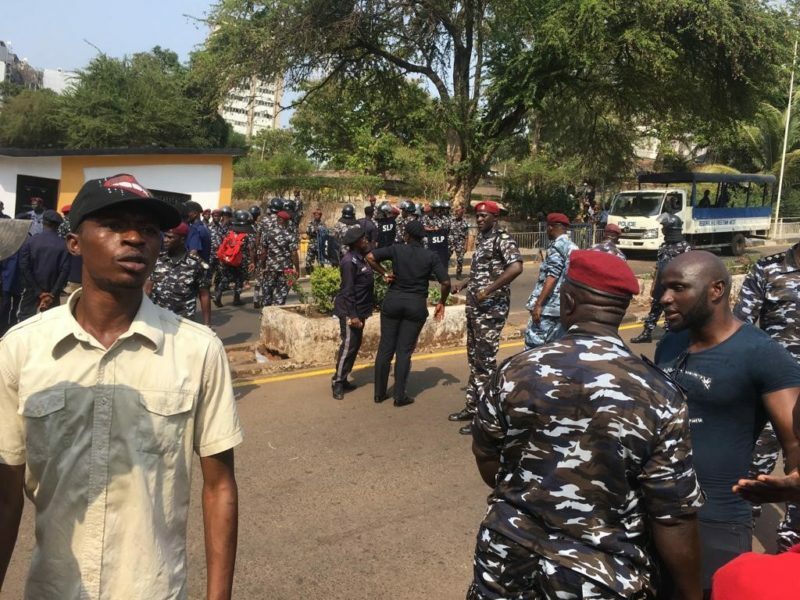 ISAT has directly trained 2,000 Sierra Leone Police officers, and they have then trained 1,000 of their own staff and 900 soldiers. The High Commissioner said that the underlying philosophy was to work in partnership with the Government of Sierra Leone. Under the New Direction there is a strong focus on education and empowerment of girls; and so the UK’s priorities here reflect that. The Deputy Finance Minister, who was also present, praised the “dialogue and close collaboration” between the UK and Sierra Leone. She thanked the donor partners particularly on judicial sector reform and the UK on support to the security sector reform. She called for predictability of assistance, to reduce delays and to not affect implementation progress. She asked that the Government of Sierra Leone and the donor partners deepen their cooperation on strengthening financial institutions, and looked forward to working with partners on the new Development Plan. In discussion about trade and investment the High Commissioner said it was important that donors and government worked together to address the barriers to investment. Part of this included making sure existing investors had a positive experience. Investment was necessary for wealth creations, which is how eventually the UK’s relationship with Sierra Leone would move from aid to trade. 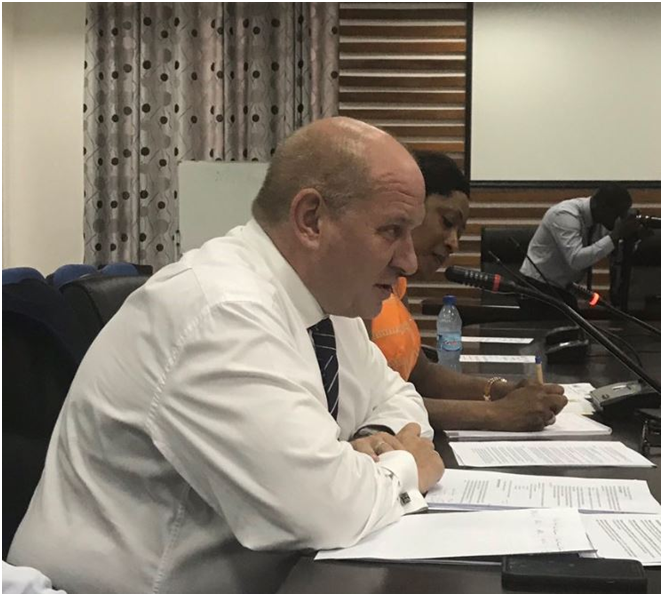 The High Commissioner spoke briefly about Brexit, confirming that the United Kingdom leaving the European Union would have no bearing on trade between the UK and Sierra Leone. He said that the UK wanted to increase the amount of trade done with Sierra Leone, as did the EU. The High Commissioner spoke about the strong cultural links between the UK and Sierra Leone, mentioning the very popular Premier League, and the presence of the British Council, who were celebrating their 75th anniversary in Sierra Leone. The British Council’s ‘Spheir’ project will improve tertiary education syllabuses in Sierra Leone. And their ‘Connecting Classrooms’ projects linked classrooms in Hull and Freetown; as well as UK and Sierra Leone cities which shared names. On Brits in Sierra Leone, the High Commissioner mentioned the hundreds of NGOs that operate here who have a UK connection. This was a large population in Sierra Leone, all working to develop the country. Facing questions, the High Commissioner explained that UK aid projects were spread across the country. He asked that Sierra Leoneans continued to submit good proposals, explaining that Sierra Leone was competing with other places for funds. And he mentioned how environmental protection can be beneficial for industry, as demonstrated by the Royal Society for the Protection of Birds-funded project in the Gola Rainforest, where environmentalists and security services had collaborated. The High Commissioner made clear that it was not the responsibility for the UK government to secure the borders of Sierra Leone. But the UK did provide training to the RSLAF, ONS and SLP, who did have the responsibility. The porous border caused issues for security, finance and environment. Police should be manning this border, he said. The High Commissioner detailed some of the work the UK is doing to support education in Sierra Leone, particularly for pregnant girls. He called on the Government to ensure that this different support was not necessary. He said that re-forestry needed to be commercial, as was the case with Miro Forestry. Illegal logging needed to be stopped so commercial forestry and export was attractive. This was a 20-year project. In a final round of questions the Deputy Finance Minister said that there would be efforts to strengthen Parliament’s oversight function. The High Commissioner called for the devolution of resources from central to local government, in line with the devolution of responsibility. In a final statement the High Commissioner asked that the role of the private sector not be ignored in the development of Sierra Leone.